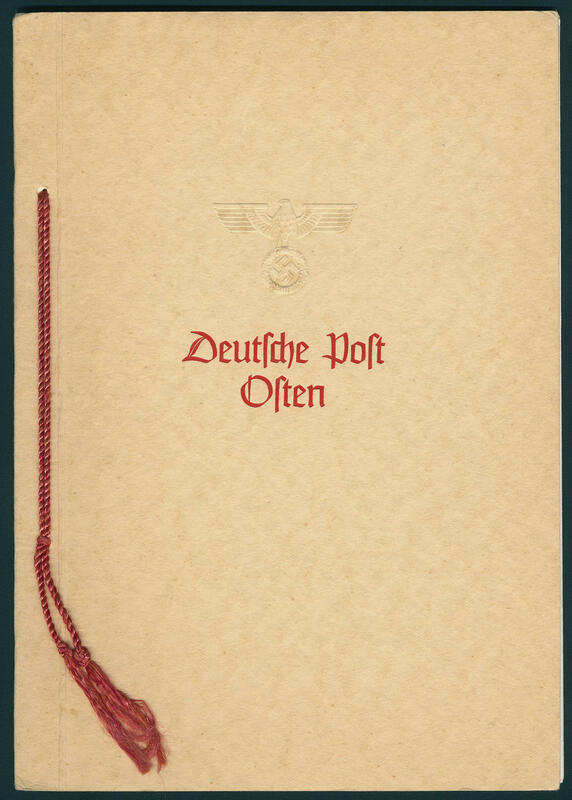 5725 GeF.Heft 14/39 Gift booklet \"German post east\" with the complete postage stamps set from 1940 unused with red string, on face colorless stamped Imperial Eagle and inscription \"German post east\". It were only a few examples at high place personalities handed over. 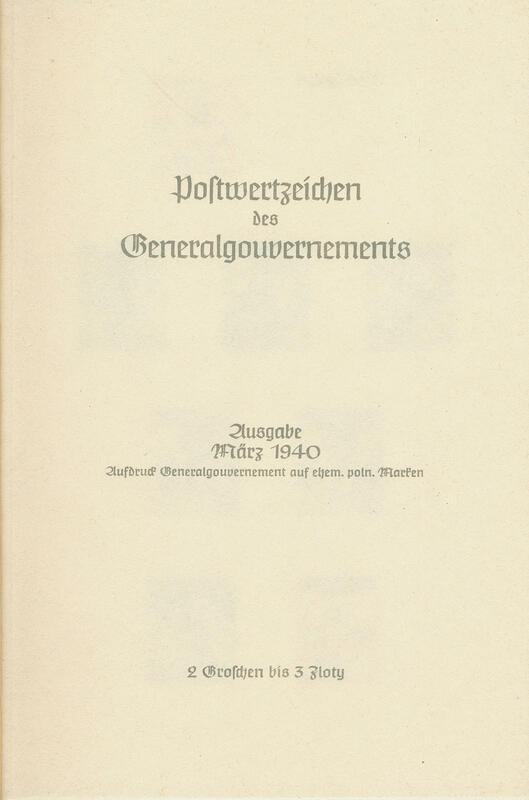 A similar gift booklet from Bohemia and Moravia with Heydrich issue obtained in of our 88. Auction a surtax from 2950,- €. 5726 45U 24 Gr. 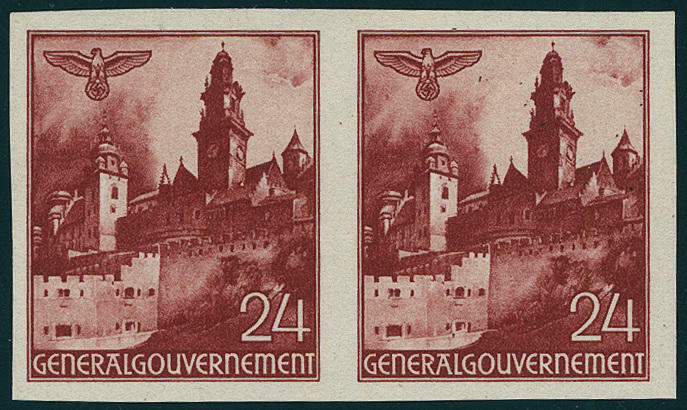 Castle Wawel, unperforated in the horizontal pair, in perfect condition mint never hinged, without signs. 5727 48U 50 Gr. 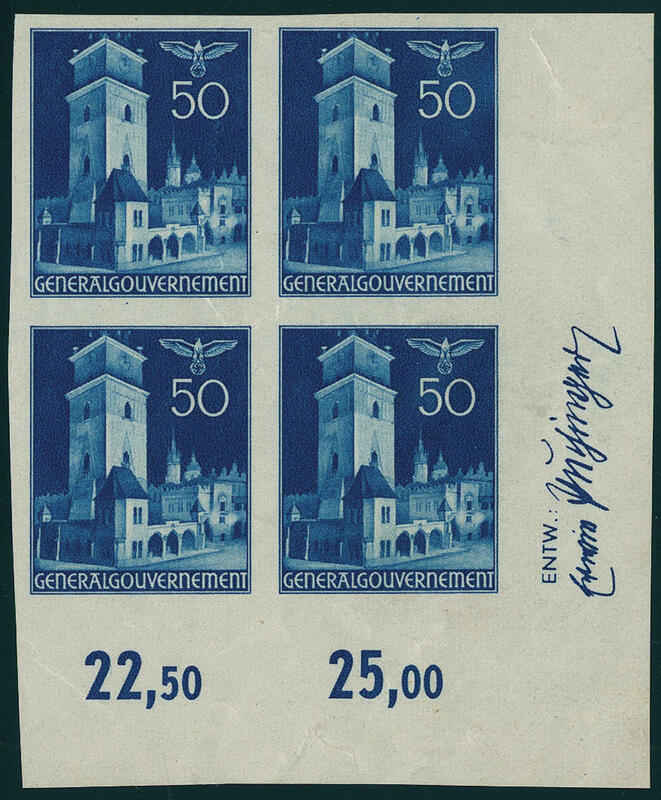 Town Hall tower Cracow, unperforated block of four from corner margin with margin figures and designer inscription in the margin, as usual gum crease, in perfect condition mint never hinged rare! 5728 104P2 1 Zl. 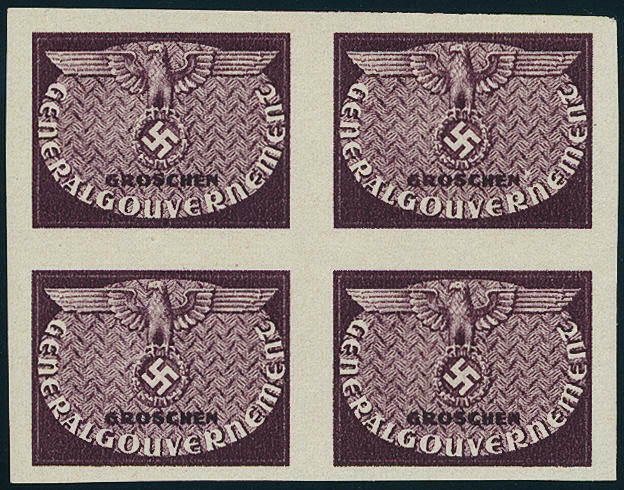 Kopernikus 1943, proof on yellowish proof paper without date imprint, horizontal strip of three unperforated with large upper margin and edge lettering \"GENERALGOUVERNEMENT German post east with Imperial Eagle\", fresh colors and large margins all around, in perfect condition on ungummed paper. A very decorative and scarce unit! Photo expertize \"perfectly quality\" Pfeiffer BPP. 5729 104P2 1 Zl. 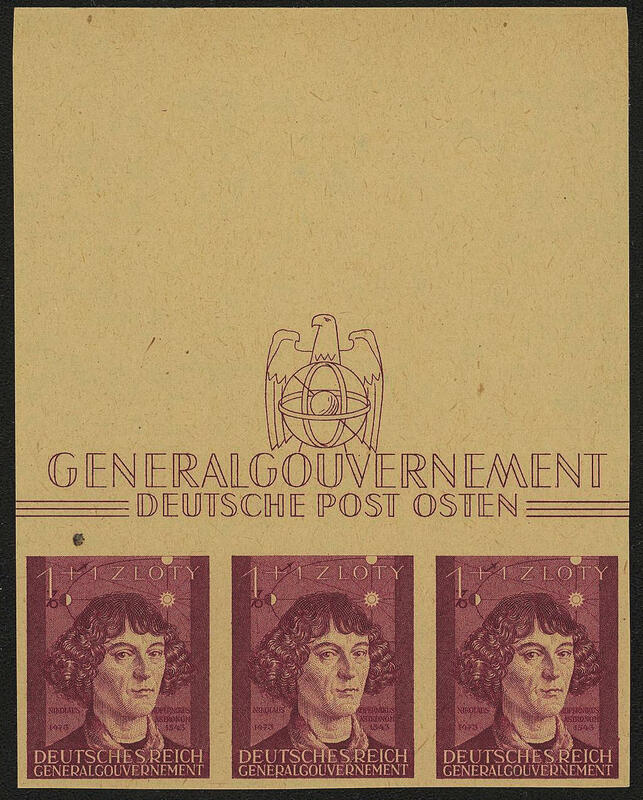 Kopernikus 1943, proof on yellowish proof paper, without date imprint, faultless block of four unperforated with on three sides margin of sheet, very decorative! 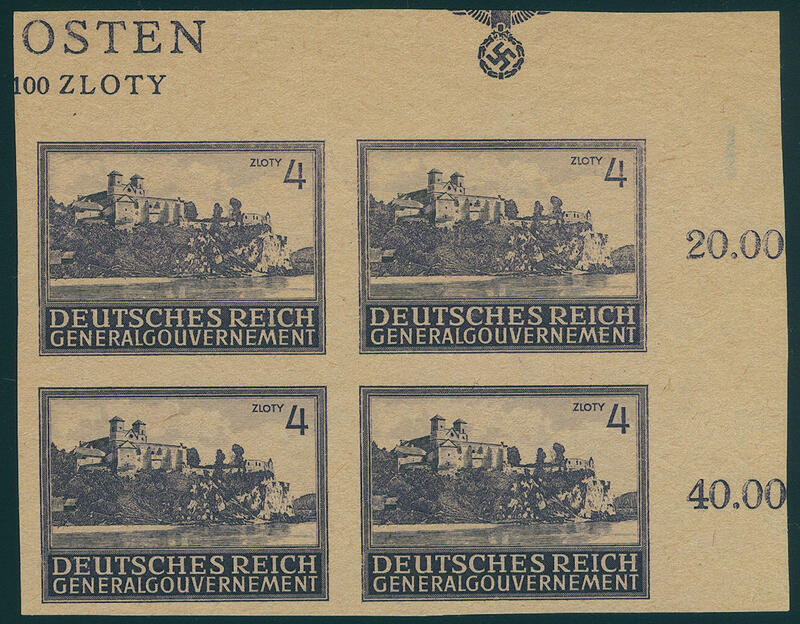 5730 114P3 4 zloty abbey Tyniec 1943, unperforated proof on yellowish, ungummed proof paper from of the right upper corner of the sheet, fresh colors and with wide margins with parts of the national emblem. A spectacular unit this extraordinarily rarely test print and in this kind probable unique! Photo expertize Swiss BPP. 5731 AP1 12 Gr. 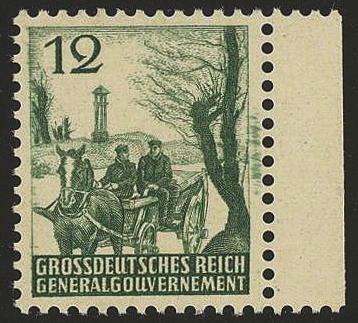 Green, the famous so-called \"PANJEWAGEN\", fresh colors and very well perforated from right margin of sheet, in perfect condition mint never hinged, without any signs. 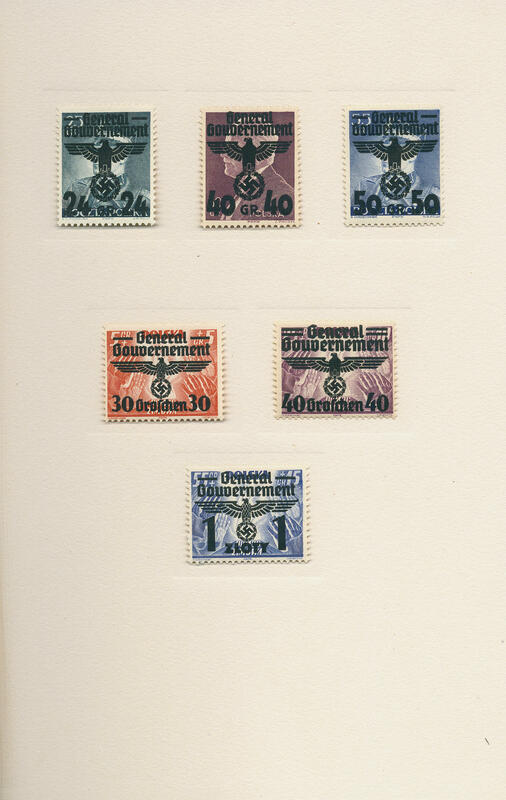 These issue belongs to the large rarities of the German occupation issues and is absent in almost all collections. An outstanding quality for the highest standards! Photo expertize Jungjohann BPP and new photo expertize Pfeiffer BPP. Michel 18000,- €. 5732 IP 6 Gr. 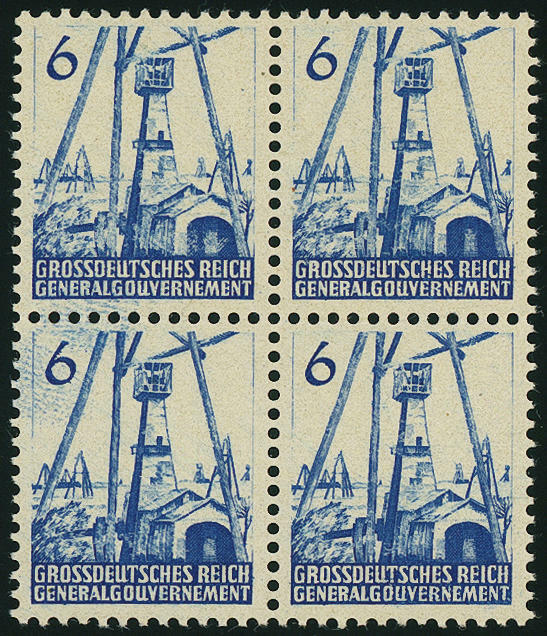 Blue, proof perforated 12 1 / 4:12 1 / 2, fresh colors block of four, tiny insignificant fingerprints, as far as in perfect condition mint never hinged a spectacular rarity of the German occupation issues, in the Michel special catalogue so unlisted and as block of four from utmost rarity! Photo expertize Pfeiffer BPP. 5733 IP 6 Gr. 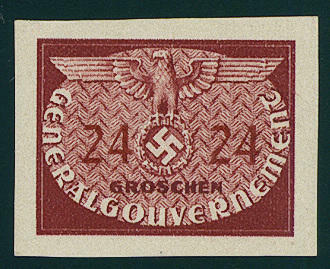 Red, proof perforated 12 1 / 4:12 1 / 2, fresh colors block of four, one stamp slight fingerprint, as far as in perfect condition mint never hinged as well the upper pair with a distinctive colour doubling. 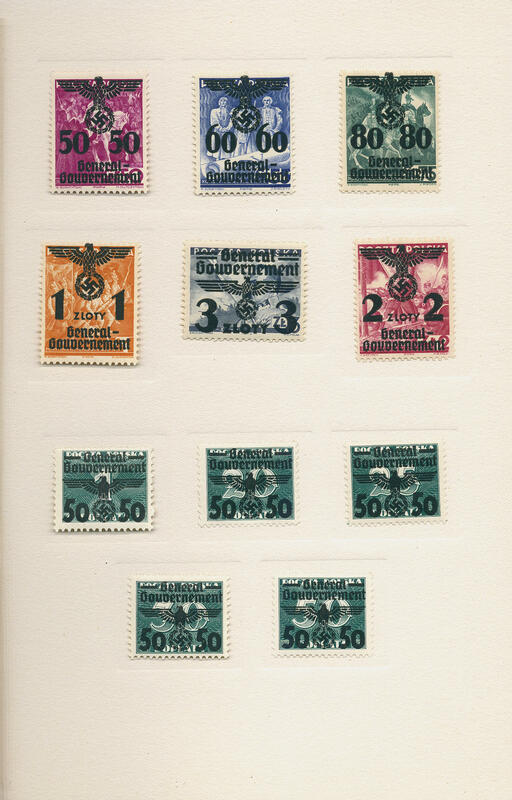 Spectacular rarity of the German occupation issues, in this kind in the Michel special catalogue unlisted! Photo expertize Pfeiffer BPP. 5734 IP 6 Gr. Dark green, proof perforated 12 1 / 4:12 1 / 2, wonderful block of four, fresh colors and in perfect condition on ungummed paper. 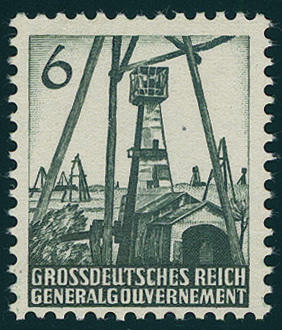 A spectacular rarity of the German occupation issues! Photo expertize Pfeiffer BPP. 5735 IP1 6 Gr. 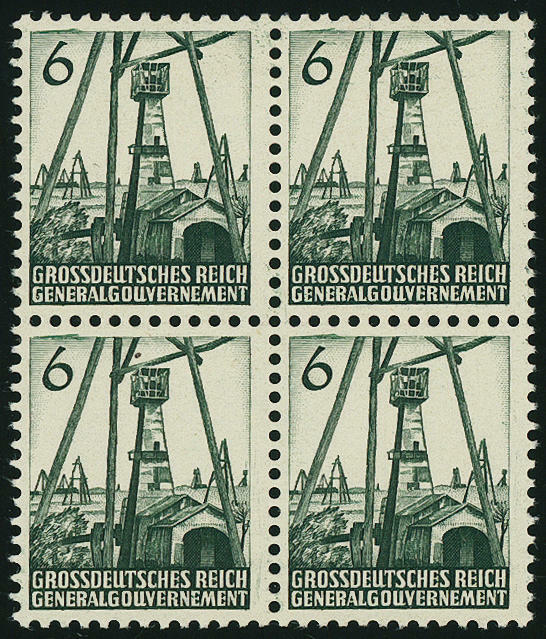 Drilling derrick 1944, proof the not issued stamp in dark green, fresh colors and very well perforated block of four, in perfect condition on ungummed paper. A significant rarity of this area! Photo expertize Jungjohann BPP. 5736 IP1 6 Gr. 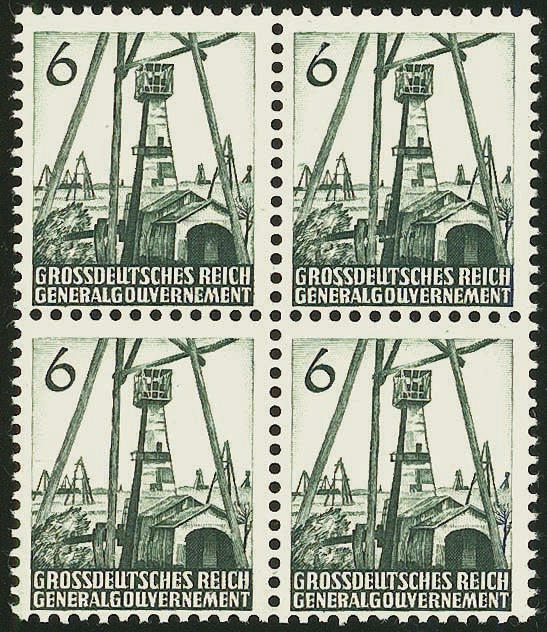 Drilling derricks, proof of the not issued value in green, fresh colors and very well perforated, in perfect condition on ungummed paper, very rare, photo expertize Jungjohann BPP. 5737 IIIP 40 Gr. 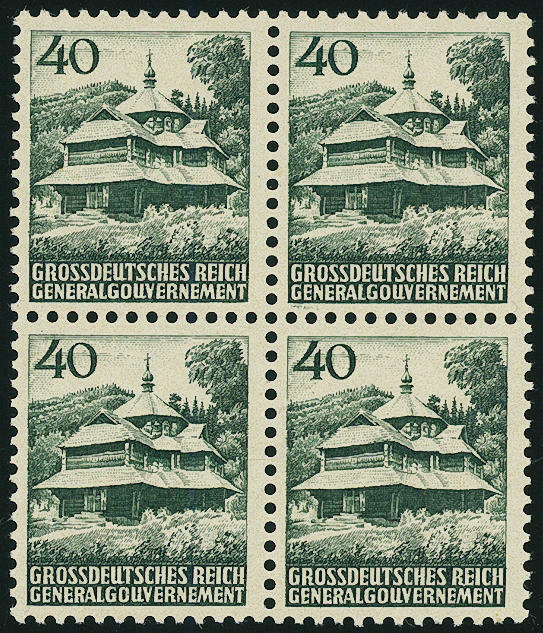 Green, proof perforated 12 1 / 4:12 1 / 2, wonderful block of four, fresh colors, tiny fingerprints, a few slight gum spots are seeming manufactured, as far as in perfect condition mint never hinged a spectacular rarity of the German occupation issues and in this kind in the Michel special catalogue unlisted! Photo expertize Pfeiffer BPP. 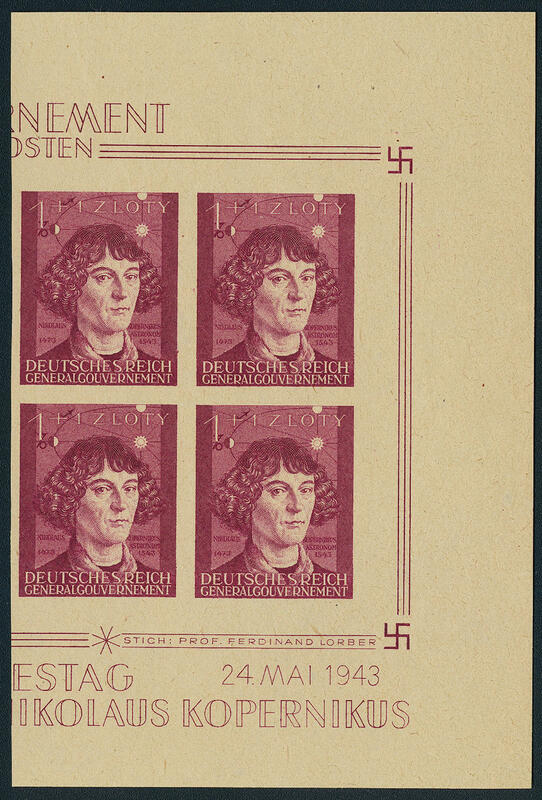 5738 16P Official stamps 1940, unperforated proof in black lilac without impresssion of the value, block of four, in perfect condition mint never hinged very rare! 5739 21U 24 Gr. 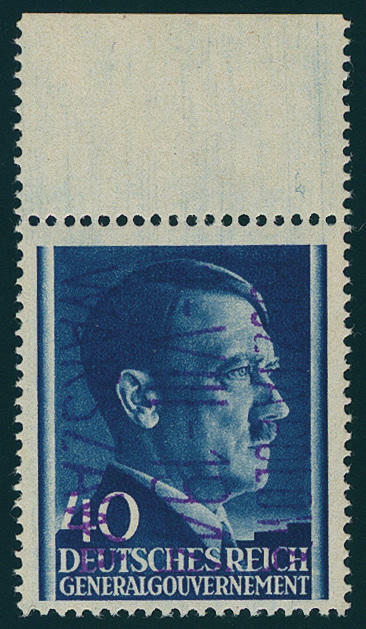 Blackish brownish red, four sides unperforated, in perfect condition mint never hinged, without signs. 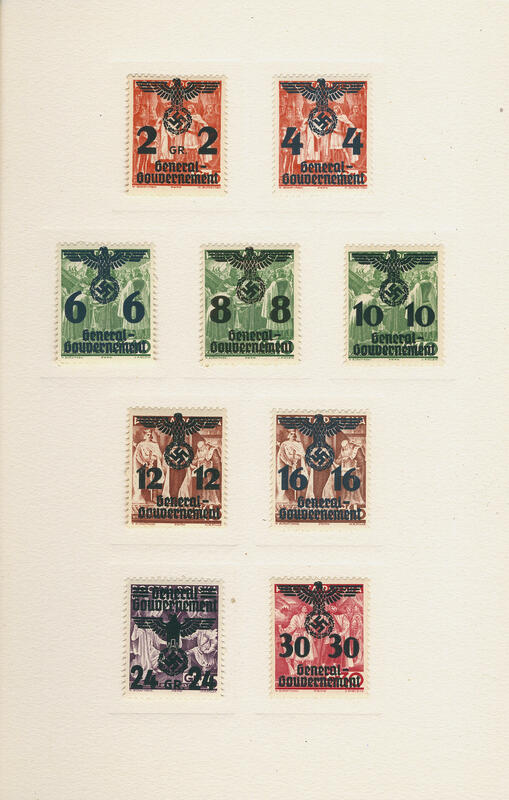 5740 72/79,81,86B Local issue Warsawa, Hitler series, all 10 values with overprint \"POCZTA POLOWA 1. VIII. 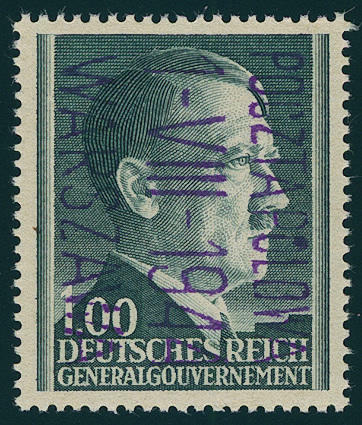 1944 WARSZAWA\", fresh colors and very well perforated, in perfect condition mint never hinged, a scarce not issued set, photo expertize Jungjohann BPP. Michel 2500,- €. 5741 I 5 Pfg. 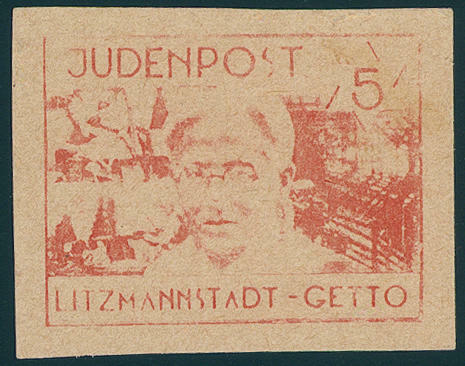 Vermilion, Jew postal service Lodz ghetto, fresh colors and with wide margins, in perfect condition on ungummed paper. 5742 IK 5 Pfg. 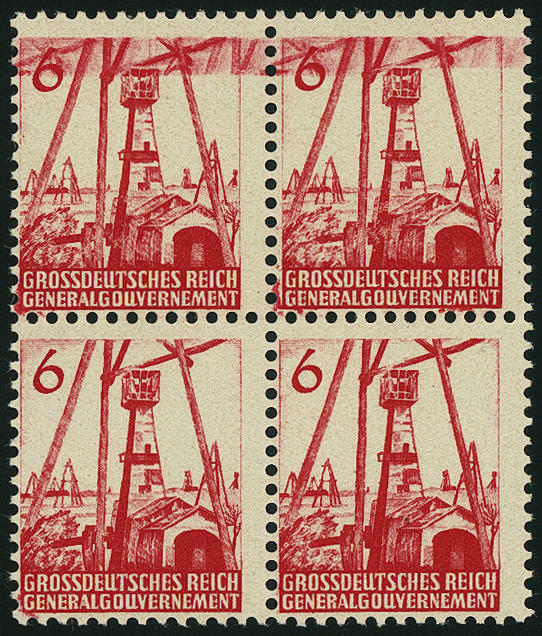 Vermilion, Jew postal service Lodz ghetto, horizontal tête-bêche pair, wonderful fresh colors and large margins all around, in perfect condition on ungummed paper, as issued in utterly perfect condition. There are only few examples hereof have been preserved! Photo expertize Krischke. 5743 VEssay 20 Pfg. 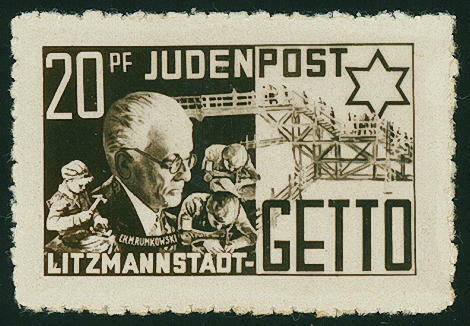 Jew postal service, Lodz ghetto, essay in brown in not appeared drawing, perforated, on gummed box glossy paper, extremely rare, expertized Jungjohann BPP. 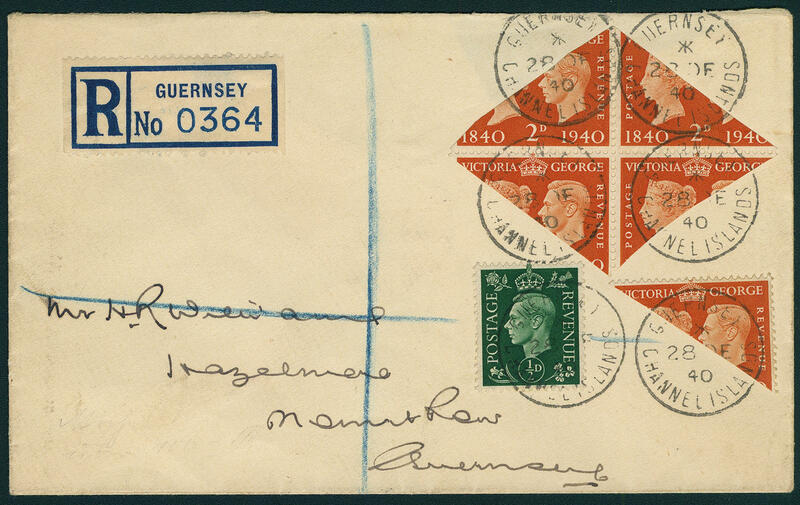 5744 ✉ II 2 P. Red orange, bisects in the form of a single piece, as well of a blocks of four with additional franking ½ P. On very nice registered cover from \"guernsey 28. DE. 40. \".